I have seen the future, my friends, and can officially tell you in one simple word what will ultimately lead to the utter destruction of the superhero genre’s seemingly unstoppable reign of supremacy at the movie box-office. This word, uncomplicated in construct and meaning, has become a ravenous plague within the studio system, gnawing at the bones of creativity and effective story-telling, and promising little more than rehashed adventures and soulless, flashy spectacle-for-the-sake-of-spectacle. It’s indeed a disturbing six-letter atrocity, and it has once again reared its vile head. No, I’m not talking about the internet neutron bomb-like Spider-Man debacle — I’ll have plenty to say about that later on down the road, little dogies — I am, instead, talking about a franchise that had its chance. A franchise that lurched awkwardly and inelegantly into multiplexes almost three years ago, klutzily tripped over its inept feet in the process and blew its dang, silly brains out all over theatre screens across the world. 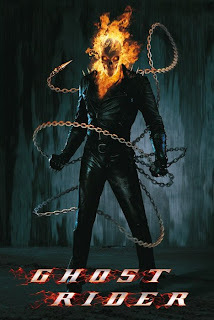 I’m referring, obviously, to ‘ol Matchstick; aka Skeletor’s combustible brother-from-another-mother; aka Mr. Meanie Melty-face; aka the one, the only Ghost Rider.